We have a variety of luxury bedrooms for you to choose from. All rooms are beautifully designed, have views of the garden, and suited to individuals, couples or two friends staying together. Price varies depending on size and occupancy. Have a look through these pictures to help you decide which bedroom you like to book for your detox programme. The Broadway room is a super king master suite with double aspect views over open countryside and the potager garden. It boasts a luxury ‘Rainmaker’ shower, toilet, air-con unit and ceiling loudspeakers. Plenty of fitted cupboards and wardrobe space. The Sudeley room has a regal feel and can be configured as two singles or as a super king with beautiful double aspect views over open countryside and the gardens. Sudeley has extensive fitted cupboards and wardrobes as well as an en suite shower room. The Toddington room is a very large room with original wood flooring and beams in the wall. 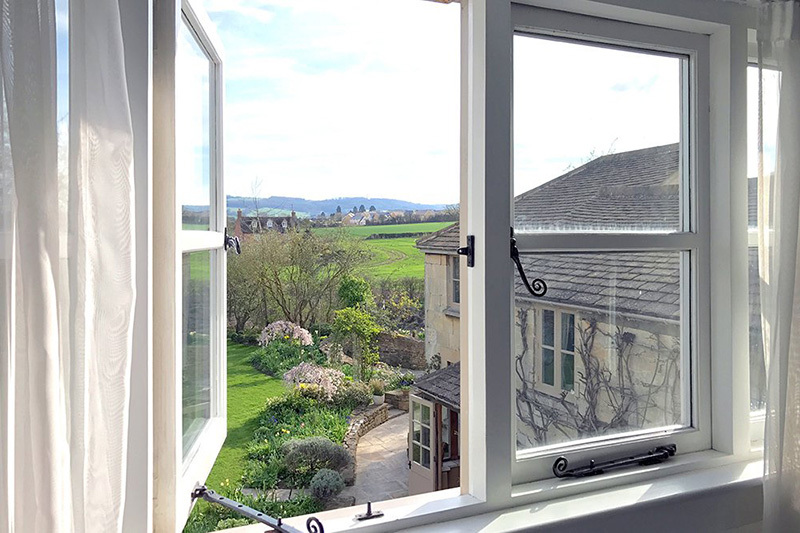 With extensive fitted cupboards and wardrobes, Winchcombe can be configured either as a superking or as two singles. Shared bathroom. Gretton is a cosy double with fitted wardrobe and cupboards in the oldest part of the house, hence slightly wonky floors. There is a voracious 200 year old wisteria outside the window that is eager to come in during the summer months. Shared bathroom. The Isbourne room is our budget option, offering stunning views with added privacy. Situated above our clinic, it provides late night sauna access and exclusive use of shared wet room outside of treatment times. This beautiful bathroom is immediately accessible to the occupants of the Gretton and Toddington bedrooms.